MarkAble is designed for podcast or audiobook listeners who own an Apple iPod or iPhone, or who use iTunes to listen to such books. 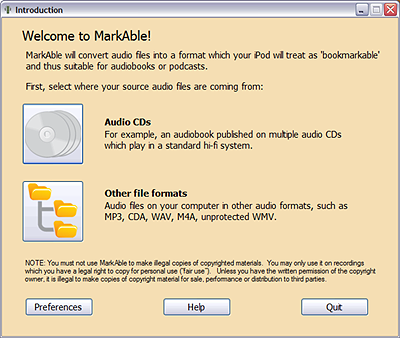 MarkAble provides a really easy, all in one solution for merging existing audio CDs, tapes, podcasts, MP3 or WAV files of audiobooks (which you already own) into a small number of bookmarking files on your iPod. Now features the ability to insert chapter stops and images. ...... This, of course, is vital. Qweas is providing links to MarkAble 2.2.8 as a courtesy, and makes no representations regarding MarkAble or any other applications or any information related thereto. Any questions, complaints or claims regarding this application MarkAble 2.2.8 must be directed to the appropriate software vendor. You may click the publisher link of MarkAble on the top of this page to get more details about the vendor.